This list originally posted on July 24, 2010 had numerous errors that thankfully kind readers have pointed out. Here is an updated version. Is the Espirit 37 one of the best 10? I contributed to a Cruisers Forum thread the other day. The fellow asked for a list of heavy displacement sailboat under 40 that are not double enders. That made me think: What are the double enders? The below list consists of ten double ended, aft cockpit sailboats. In the 1970’s, a canoe stern was standard on serious cruising sailboats popularized by the Westsail 32. In compiling my list, I tried to avoid many of the character type, teak laden, full keeled double enders. A canoe stern was mostly paired with a full keel until the design just completely went out of style. Even Valiant Yachts has gone out of business in 2011, so I cannot name a canoe stern maker in current production. A double ender does still stir that dream of cruising to far off places. For a single sailor or couple, some of these yachts are excellent options. Others offer terrible performance but offshore security. A few are too unrealistically built for the lower latitudes because of high maintenance teak exteriors. Some have aft cabins while others have only a single cabin forward. A good portion are Robert Perry designs, the master of canoe sterns. I have kept to a price range of $100,000 to $200,000 with lengths between 36 and 41 feet. Please comment below with any suggested additions or subtractions. I have listed the sailboats in alphabetical order of brand name. Baba 40: Robert Perry design with many smaller sisterships. Built strong by the Ta Shing yard famous for Taswell yachts and Norhavn trawlers. Baba was the first chronologically in this line, then Panda, and finally Tashiba. Corbin 39 Aft Cockpit: French Canadian built boats that were home finished. The factory produced the hull and deck but left interior detailing to the owner. Comes in many different deck molds including center cockpit versions. The later versions have a bowsprit to balance the helm. Espirit 37: Robert Perry design for Valiant yachts. Perry says this is the loveliest canoe stern he ever drew. Fast Passage 39: Rare William Garden design. Only 40 were built by Tollycraft but recently a fellow has purchased the tooling for new production. Hans Christian 38 Traditional: Woody Ives design. Original HC 36 is a Perry inspired design. Beautiful teak laden cruising machine. Telstar versions have modern fin keeled underbody. Pacific Seacraft 37: William Crealock design with fin keel and traditional lines. The company went out of business in 2008 and moved from California to North Carolina to continue production. Southern Cross 39: Thomas Gilmer design with Airex cored hull and fin keel underbody. Smaller 31 and 35 foot sisters. 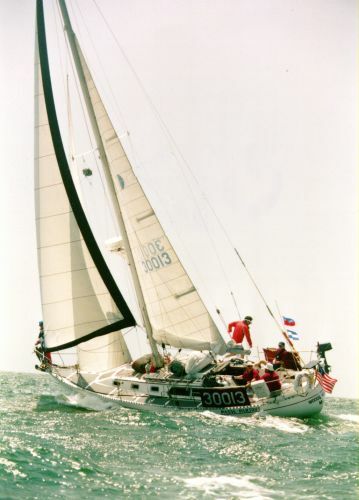 Tayana 37: Prolific Robert Perry design that comes in many deck variations including ketch rigs. The raked mast produced wicked weather helm and a water tank forward makes her pound according to Perry and TOG News. Valiant 42: Robert Perry design with a bowsprit added to Valiant 40. Has great sea motion and strong build. This is the original and still a great choice for a performance cruiser. Vancouver 36: Rare smaller version of Vancouver 42 by Robert Harris. Built like a tank by Durbeck and later Hidden Harbor in Sarasota, Florida. Only has a single pullman berth. For detailed reviews of most of these yachts and more, please see Bluewater Boats.